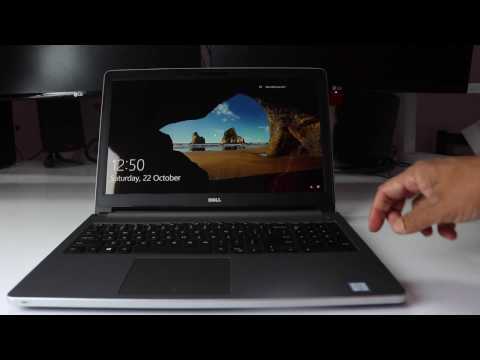 If you own Dell Inspiron 15 5559 (Z566110HIN9) (i5 6th Gen/8GB/1TB/Win 10/4GB GFX), please do leave your feedback too. The Inspiron 5559 from Dell is a power packed laptop featuring specifications that can get you through both your professional needs and gaming requirements owing to its buffed up specifications. The laptop sports a robust body made out of fibre and ships in a dark grey colour variant. The laptop, under its hood, sports a sixth generation i5 processor from Intel. The processor is clocked at 2.3GHz and can be further clocked up to 2.8GHz through turbo boost. The laptop also features an AMD Radeon R5 M335 graphics processor offering 4GB of dedicated graphics memory in addition to 8GB of DDR3 RAM. On the storage front, the device packs in a 1TB HDD hard disk for storing all your personal data. On the display side of thing, the laptop features a 15.6-inch Full HD panel boasting a resolution of 1920 x 1080 pixels. The display provides for a crisp viewing experience and is suitable for gaming as well as media. As far as audio output is concerned, the device features a set of stereo speakers that provide for a good audio experience. On the software front, the laptop comes with Windows 10 pre-installed. This means it has all the goodness Windows 10 has to offer and saving you time to find drivers as well. You can also dual-boot the laptop to support Linux if you wish to. As far as connectivity goes, similar to other laptops, the Inspiron 5559 also offers WiFi, Bluetooth and Ethernet through the RJ45 LAN port. To interface data with the laptop, Dell has provided two USB 2.0 ports and one USB 3.0 port alongside a card reader. The laptop also features an HDMI port to share your screen with a larger display and a VGA port to use multiple screens.